Blu-Ray Review: RAIDERS! | "DESTROY ALL FANBOYS!" For the uninitiated, In a nutshell: back in 1982, teenagers Chris Strompolos, Eric Zala, and Jayson Lamb decide to make a shot-for-shot remake of Raiders of the Lost Ark, which took seven summers to complete, save for one particularly effects-heavy sequence the documentary shows being planned and newly shot as the film progresses. Actually, it shows the problematic shooting of that sequence, from overbuilding a key prop, weather being a key reason green screen is a thing, and that at end end of the day, making your dreams come true isn’t at all magical. The doc also reveals the trio haven’t always been tight as a drum with the whole friendship thing thanks to the usual human foibles we all have. That the film even got made through thick and thin, accidents, and a bit of stupid behavior is pretty remarkable. That the came back for one last scene is even more so, especially as it ends up being, well… a perfect Hollywood moment you couldn’t script any better than what’s here. Everything zips along at a merry pace, info dropping fast, but always digestible. The spouses here are incredible, putting up with their men an this obsession, but it’s not a rare thing at all that wives accept their hubby’s hobbies. Just like the myth that girl gamers are hard to find (oh, please – I can toss a plush Tribble at a comic convention and hit ten of them before some stinky guy’s funk shield makes it explode into fuzzy dust), ladies with that lovably dorky side are legion. Anyway, as documentaries go, this one’s great as well as a keeper, I say. If you haven’t seen the fan film yet, well… you know where to look. If you’re introducing yourself or someone else to this, yeah… make sure to see the source material first, please. Just so if you happen to run across Mr. Spielberg, you get the thanking order as it’s supposed to be. 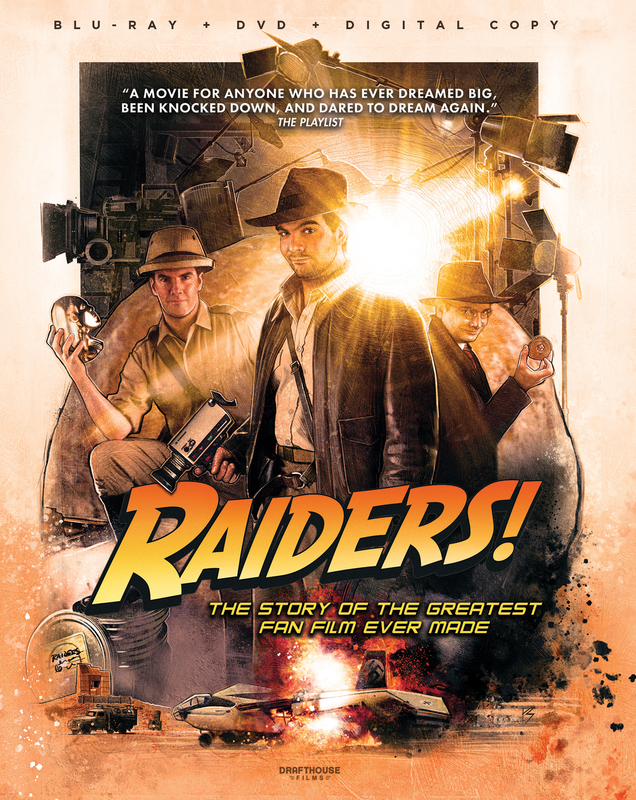 This entry was posted in 2016, Commentary, DAF, Features, Humor, Updates and tagged Blu-Ray/DVD, BUY THIS FILM!, Documentaries, Drafthouse Films, Holiday Gift Guide 2016, Movie Reviews, Movies, MVD Entertainment Group, RAIDERS! The Story of the Greatest Fan Film Ever Made, Reviews by geelw. Bookmark the permalink.